Forty-five seconds of swirling dust was all it took to kill two U.S. Marines and injure 20 other service members. On May 17, 2015, a Marine Corps V-22 Osprey tiltrotor — a $70-million hybrid aircraft that takes off like a helicopter but cruises like an airplane thanks to its rotating engine nacelles — flew into a cloud of sand kicked up by its rotors while the transport was landing on the island Oahu as part of a training exercise. 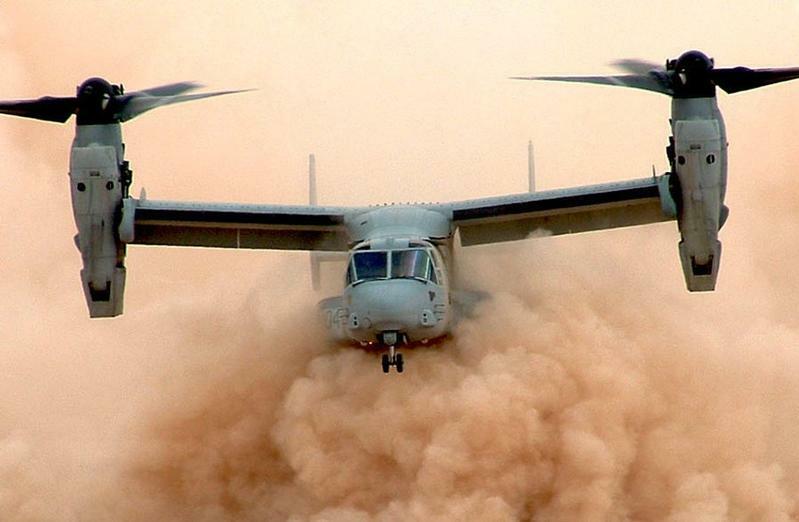 The Osprey’s engines, which run unusually hot owing to the tiltrotor’s ungainly aerodynamics, sucked in the unexpectedly fine sand. 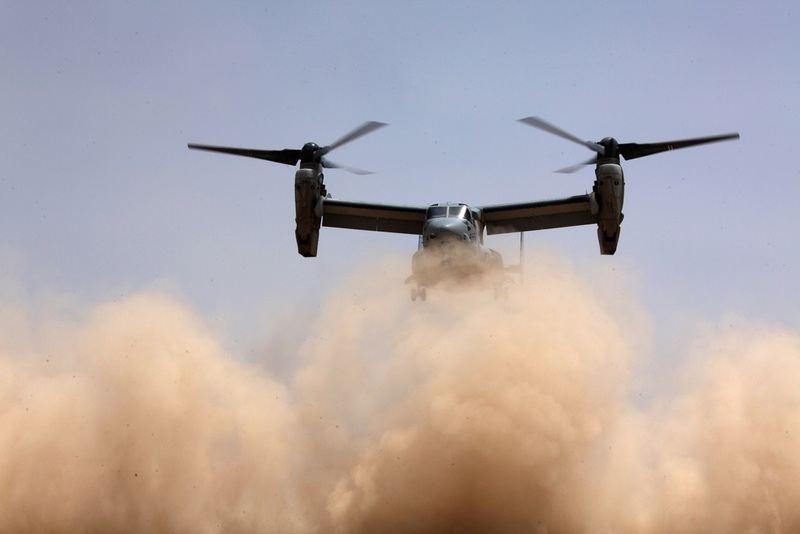 The Pentagon had advised V-22 pilots that their finicky aircraft could withstand such dust clouds for 60 seconds before risking a major problem. But on that May morning, the V-22 suffered a catastrophic engine failure after just 45 seconds of breathing dust. Two Marines — Lance Corporals Joshua Barron and Matthew Determan — died when the transport tumbled to the ground and burst into flames. In the aftermath of the crash, the military amended its flight rules for the V-22, advising that pilots evacuate a dust cloud after just 35 seconds instead of a full minute. The policy change might seem like a tacit acknowledgment that the Osprey and the Pentagon bureaucracy that set the rules for flying the tiltrotor — rather than the pilots of the crashed aircraft — was to blame for the Oahu fatalities. But no, the Marine Corps actually blamed the aircrew for the accident. And not for the first time. The V-22, which has been in development since the 1980s, is not a safe machine — it crashes and burns at a higher rate than military officials care to admit. But the Marine Corps and other users of the high-tech, expensive tiltrotor have created the impression that Osprey is safe, in part by blaming its crews for incidents that weren’t, in fact, their faults. The V-22 flies inside a protective screen of senior officers, bureaucrats and public affairs flacks who help to obfuscate the true dangers associated with the tiltrotor’s novel flight characteristics. Only a few people have dared to question the military’s spin about the Osprey’s safety. Among them — the family of crash-victim Matthew Determan. Hawaii is beautiful, even when it’s overcast. The morning of May 17, 2015 was a cloudy one. The 15th Marine Expeditionary Unit had traveled from Camp Pendleton in San Diego to Bellows Air Force Station in Oahu ahead of a seven-month deployment. In a few days the Marines would ship out across the Pacific to spend the next half year in Asia and the Middle East. The rocky cliffs, rolling waves and beautiful hot springs of Oahu, only somewhat muted by the clouds, were paradise’s parting gift. But the Marines weren’t in Hawaii to take in the islands’ natural beauty. They were there to train. Expeditionary units are the American military’s first-responders, ready to march, sail or fly into trouble at a moment’s notice. 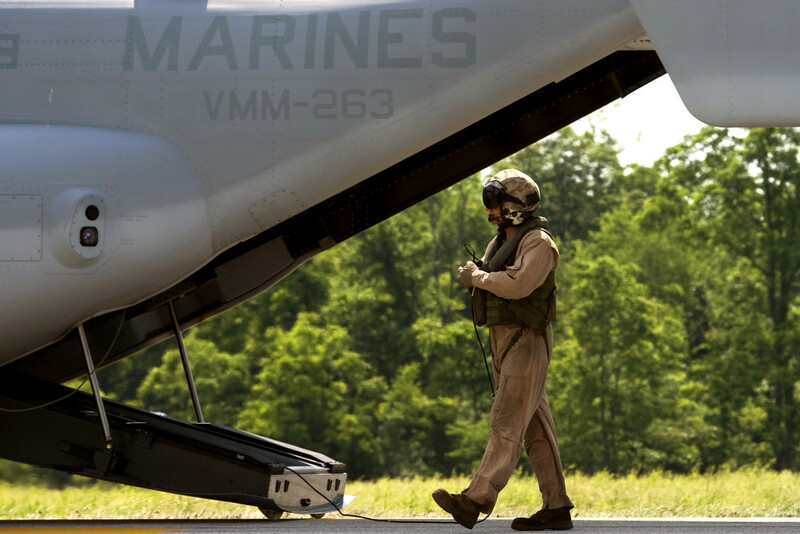 The Marines deploy quickly in response to threats and disasters. Marine Expeditionary Units helped survivors of the devastating earthquakes in Haiti in 2010 and Nepal five years later. The 15th and other MEUs rely on the MV-22B Osprey to help them quickly get into and around war and disaster zones. With its engine nacelles pointing downward, it can take off and land vertically on ships or small landing fields. Rotating its engines to face forward, it cruises like an airplane — faster and over greater distances than is possible with a traditional rotorcraft. On May 17, the Marines of the 15th MEU were training with the new machine. It was all fairly routine … until it wasn’t. Launching from the deck of the Navy assault ship USS Essex sailing 100 miles off the coast of Oahu, the Marines and accompanying sailors practiced landing, unloading, reloading and returning to ship. Five Ospreys flew back and forth during the day. But something went wrong just after 11:00 a.m. local time, on the second round trip from Essex. Osprey number 168020 had a problem. As it descended to the landing zone at Bellows the powerful rotors kicked up dust and sand that quickly enveloped the aircraft. The aircrew couldn’t see to land, a condition pilots call “brownout.” Which shouldn’t be a problem. The Osprey boasts sophisticated avionics and controls, including an autopilot that projects a digital target onto the pilot’s heads-up display, indicating the ground’s position even when it’s obscured by dust. But the auto-landing function is only helpful if the Osprey’s engines are working and the crew can control the aircraft. As the pilot tried to land 168020, the aircraft’s engines sucked in the distinctively Hawaiian mix of calcium, magnesium, aluminum and silicon. The sand melted in the intense heat of at least one of the two engines — no less that 1,200 degrees Fahrenheit — and stuck to the internal turbine in the form of glass. The Osprey has a filter called the Engine Air Particle Separator that’s supposed to remove dust from incoming air and keep the engines clean. But it works only if the pilot doesn’t spend too much time in the debris cloud. At the time, the Marine Corps claimed the Osprey could safely hover in dust for up to 60 seconds. Osprey 168020 had been in the cloud for just 45 seconds when its left engine stalled. Amateur videos of the incident shot by civilian bystanders show the aircraft falling and disappearing into a cloud of dust. Then an explosion. “Stay back,” one witness said. “Call 9-1-1.” Several rushed toward the downed aircraft. Civilians reportedly scaled the barbed wire fence surrounding Bellows to reach the 22 crew and passengers, all of whom were injured … or already dead. One person loaded two injured Marines including Determan into a pickup truck and drove to Castle Medical Center — the location of the nearest emergency room — 10 miles away. Paramedics and firefighters arrived half an hour after the crash. Joshua Barron had died on impact. Matthew Determan passed away at a hospital on May 19. In the aftermath of Osprey 168020’s fatal tumble, it took only a few days for the V-22’s defenders to mobilize. Four months later, Marine Corps investigators would blame the pilot and co-pilot — whose names the military has never released — for the deaths. “A proper risk assessment should have prompted the pilots to choose an alternate flight profile, path or landing site that would have minimized or avoided the severe brownout conditions,” the Marine Corps stated in a press release. The Marines reprimanded the two pilots but let them keep their wings. A battalion commander also received an official reprimand for not sending a research team to the landing zone before the May 17 exercise in order to assess the local conditions … and for not positioning emergency crews at Bellows in case of a crash. But by July 16, curiously, military officials lowered the V-22’s maximum “safe” time in a dust cloud from 60 to 35 seconds, seemingly acknowledging that the pilots weren’t in fact to blame — and that the military’s guidelines for flying the Osprey had steered the aircrew wrong that fateful day on Oahu. Lance Cpl. Joshua Barron was from Spokane, Washington. He was 24 years old when he died. Growing up, Barron was an avid hockey player and outdoorsman. He enjoyed hiking, fishing and hunting. 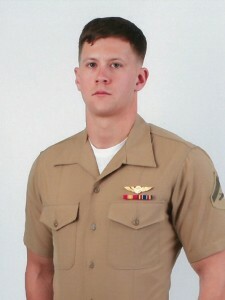 He joined the Marines in 2011 after earning an associate degree at Spokane Community College. 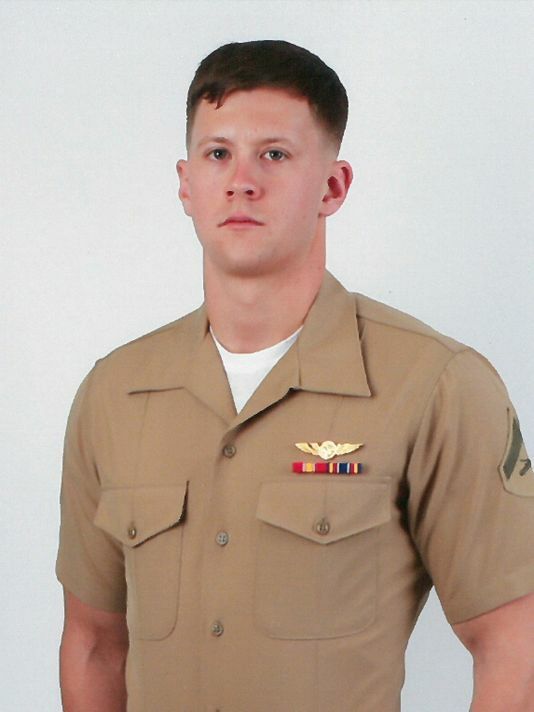 He trained to become an Osprey crew chief and joined Marine Medium Tiltrotor Squadron 161 in Miramar, California. At the time of the accident, the squadron was attached to the 15th MEU. Determan turned 21 years old shortly before the crash that claimed his life. 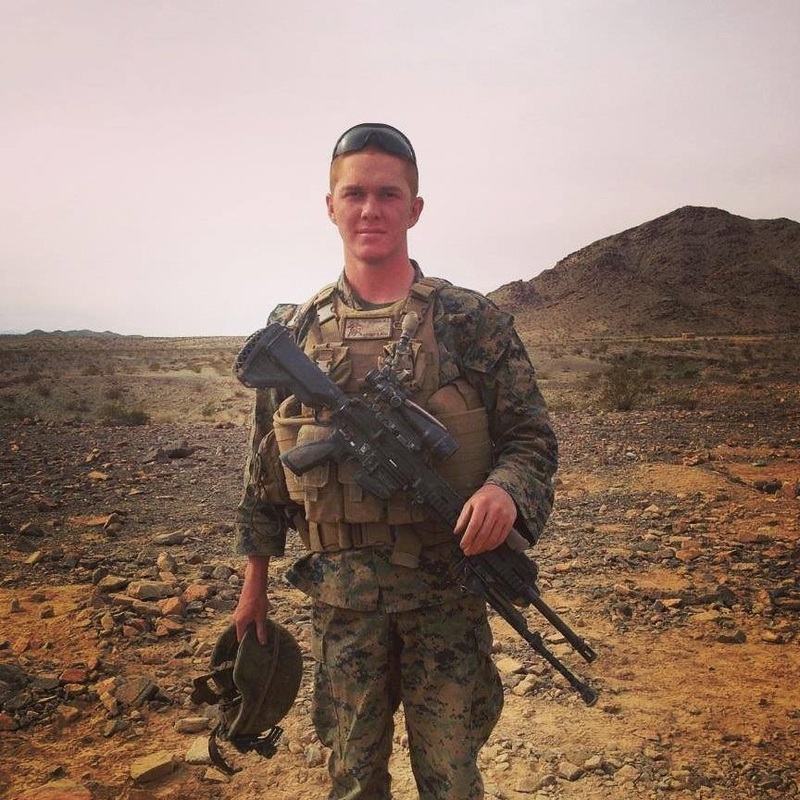 Afterward, friends and family told reporters about a hardworking young man who’d long dreamed of becoming a Marine. Mike, an Air Force veteran, acquired via the Freedom of Information Act documents related to the crash investigation. A 12-page presentation from NAVAIR, the umbrella organization for Navy and Marine Corps aircraft, entitled “V-22 AE 1107C Engine Surge in RVL Environments” and dated Sept. 9, 2015, showed that on the day of the crash a second Osprey in the same formation as 168020 had a “near miss” also owing to sand-ingestion problems. Following more than 20 years of development that included four crashes and 30 fatalities, the Marine Corps declared its first V-22s combat-ready in 2007. Two years later, the Air Force debuted its own CV-22 version of the tiltrotor, optimized for inserting Special Operations Forces behind enemy lines. In January 2015, the Navy announced a plan to buy V-22s for cargo flights between land bases and aircraft carriers. The Pentagon could end up with more than 400 Ospreys. And if history holds, it can expect scores of them to crash and burn over their decades of service. But the way the military categorizes V-22 accidents has the effect of making them seem rarer, and less severe, than they actually are and, wherever possible, shifting the blame to human operators rather than the machine itself. The Pentagon’s obfuscation of the Oahu crash is just the latest example of this dishonest, dangerous and reputation-destroying practice. Since 2006, the U.S. Marine Corps’ MV-22 fleet has suffered at least seven “Class A” and seven “Class B” incidents, including the Class A accident that killed Determan and Barron, according to official data the Naval Safety Center provided to War Is Boring. The accidents have claimed the lives of five Marines and destroyed four Ospreys. In the same period, the U.S. Air Force lost five people and two CV-22s in three Class A mishaps, according to the Air Force Safety Center’s website. The flying branch’s Ospreys have been involved in another 18 Class B events, including 12 in just the last three years. The Pentagon defines a Class A incident as any aviation accident where someone dies or is totally and permanently disabled or where the aircraft is completely destroyed or suffers more than $2 million in damage. The threshold for Class B is $500,000 in damage, anyone ending up with a lasting partial disability or if three or more troops go to the hospital. The V-22 actually boasts a relatively tame official accident rate compared to some other aircraft. Marine and Air Force Ospreys have suffered around three Class A mishaps for every 100,000 flight hours in the past eight years, according to the official data. On average, every five years, the Air Force’s conventional HH-60 rescue choppers have accidents twice as often. And F-16 fighter jets fall out of the sky at an exponentially higher rate than the flying branch’s CV-22s do. But the military works harder to spin the V-22’s safety record than it does with other aircraft — perhaps to help protect the high-tech tiltrotor from cancellation or cutbacks following a particularly bloody early development. The very first V-22 accident, in 1991, injured two test pilots. The next year another V-22 crashed following an engine fire. Seven Marines died when the tiltrotor plunged into the Potomac River near Quantico, Virginia in full view of a group of congressional representatives and other officials. On April 8, 2000, a V-22 crashed at Marana Airport northwest of Tucson. Nineteen Marines died. The Marine Corps blamed the Arizona accident on the pilots’ sharp descent resulting in a then-poorly understood condition called “vortex ring state,” which prevents a rotor from providing lift. 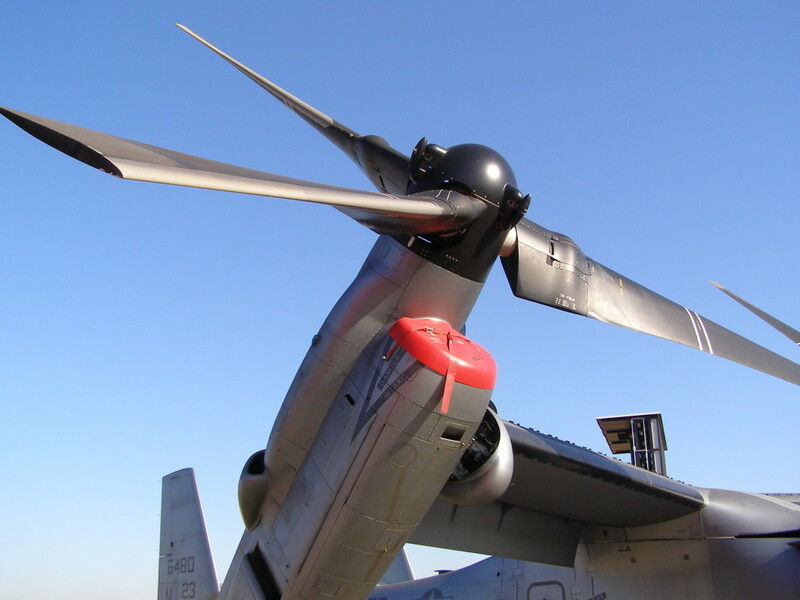 Bell and Boeing redesigned the Osprey in the years following the Marana crash. The result was practically a brand-new aircraft with more reliable internal components. But even the new-and-improved second-generation V-22 is unreliable and accident-prone. On July 10, 2006, a V-22 made an unscheduled stop in Iceland after the engine caught fire. The aircraft was on the first ever trans-Atlantic flight for the type en route to the prestigious Farnborough Airshow in the United Kingdom. Navy investigators finally tracked down a source of the problem after another MV-22’s engine burst into flames and compelled the crew to make an emergency landing at Camp Lejeune in North Carolina on Nov. 6, 2007. The Engine Air Particle Separator — the same device Mike Determan implicated in the 2015 Oahu crash — had created a shockwave that jarred loose the hydraulic system inside the engine bays. With hydraulic fluids leaking into the compartment, it was only be a matter of time before the tiltrotor’s hot exhaust set everything alight. The Navy claimed only the early-model Block A aircraft, then relegated to training missions, were affected by the problem. An upgrade on later Block B Ospreys apparently fixed the issue. It’s not clear whether Boeing had designed the modification specifically to prevent the fires. Regardless, the company and the Pentagon refer to the older aircraft as “safe and operational” in official literature and briefings. Accidents continued despite the filter fix. Between 2006 and 2009, Osprey crews made emergency landings at least six times owing to in-flight engine fires and breakdowns. Then after 2010, human error began to replace mechanical and other issues as the official reason the military most commonly cited for Osprey mishaps. Which makes some sense. One would expect that as crews learn to fly a new aircraft and engineers find and fix its defects, it would generally become more reliable. This has always been the Pentagon’s official line with regard to the V-22. “It will improve, as it’s already improved markedly,” Marine Corps Brig. Gen. James Amos, then the Deputy Assistant Commandant for Aviation, said about the Osprey back in 2000. The litany of human error is tragic and at times gruesome. On July 7, 2011, cargo came loose inside an Osprey’s rear compartment during a mission in Afghanistan and ejected a Marine from the aircraft, killing him. On May 19, 2014, a Marine died after falling from a V-22 mid-flight. Five months later, another tiltrotor lost power during takeoff from the USS Makin Island and partially plunged into the Persian Gulf. A Marine drowned after bailing out of the semi-submerged Osprey. But perhaps the most serious recent V-22 crash wasn’t the crew’s fault, even though the military insisted that it was and even wrecked the career of one general who protested the blaming. On April 9, 2010, an Air Force CV-22 plowed into the ground near Qalat, Afghanistan, killing four people on board. Brig. Gen. Donald Harvel — the lead investigator — refused to attribute the crash to any single cause. In his final report, Harvel cited human error along with environmental conditions, the aircraft’s basic performance and even how commanders in Afghanistan had planned the mission. Harvel claimed the Air Force retaliated against him for this broad determination. He said his superiors ordered him to drop any references to engine failure and instead focus on the crew’s errors. “I turned [my report] in and I knew that my career was done,” Harvel, now retired, said in 2012. The pilot of an escorting A-10 attack plane reported a stream of liquid coming off the Osprey before it smashed into the ground. Flying at night in the desert with reduced visibility, the crew could have descended faster than normal. The Marines and Air Force blamed pilots in three other instances where V-22s flew out of control and slammed into the ground. Despite these rulings, after each of these cases the two services have updated procedures and training regimens to prevent similar accidents. After another crash in Afghanistan on Oct. 11, 2011, the Air Force blamed the pilot for taking off too soon after another Osprey and losing control following a near collision. In the final review, however, investigator Col. Brett Sharp pointed out that the rule the aviator supposedly broke was explained inconsistently and confusingly across three different manuals. The instructions had “become ambiguous,” Sharp wrote in his final report. Eight months later, another CV-22 went down in Florida on a training mission. Again, the flying branch pointed the finger at the crew. But after the accident, Air Force officials admitted that the formation training had been inadequate and decided to send all new Osprey pilots to learn their skills from the Marines. After Determan’s Osprey crashed in Hawaii, the Corps went through many of the same motions. While officials held the crew responsible, they also indicated a need for improved filters to screen debris from the engines — by now a long-standing issue. Pilots were further instructed not to fly in and hover in dusty or sandy locales for longer than 35 seconds — nearly a half-minute less than rules had allowed prior to the accident. “Blaming the mishap on ‘pilot error’ is astounding to me,” Harvel said of the Oahu crash. It’s clear the military knows that swirling dust can endanger a V-22 regardless of the pilot’s skill or level of preparation. During an earthquake-relief mission in Nepal in May 2015, the downwash from a V-22’s rotors “resulted in severe brownout and unsafe conditions for nearby structures,” one official situation report explained. Other notices indicated the Marines preferred smaller UH-1Y helicopters in many cases due to various hazards the mountainous terrain posed to the more finicky tiltrotors — especially brownout landings. 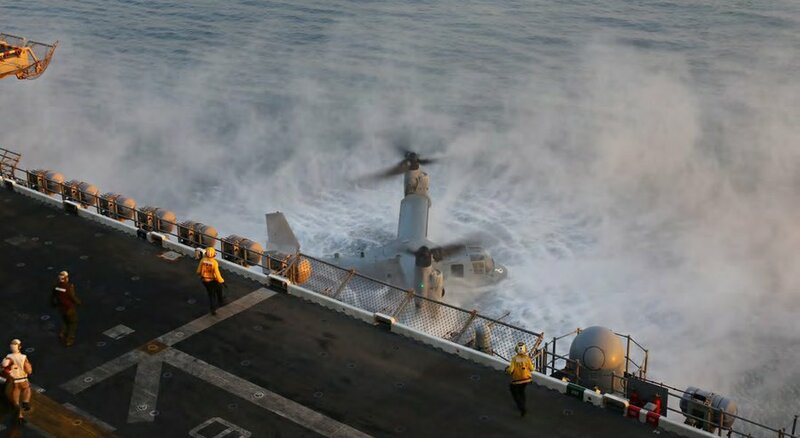 In September 2015, the Navy’s V-22 team presented a briefing on the danger of these “reduced visibility landings.” The engineers described four instances, including Determan’s crash, where “reactive sand” had led to rapid power loss and a subsequent surge in at least one engine. Reactive sand — like the kind in Oahu — has a high concentration of alkali metals that can have detrimental or unintended effects when it combines with other materials or melts onto a hot surface. The team reported they had found six other mishaps in areas where reactive sand might have been present and were working with engine-maker Rolls Royce to see if there were any other suspicious accidents. According to the briefing, the crews only became aware of the sand contamination when the engine failed. The “AE 1107C [engine] has not been qualified for operation in reactive sand; effects unknown,” another bullet point read. In crashing and burning over the years, America’s V-22s have left a trail of bodies … and lawsuits. Gerald Mayan and Robert Rayburn, both former Boeing employees, sued three companies after a 1992 accident that killed four aircrew. The two sought more than $2 million from Bell, General Motors — which built the engine — and Macrotech Fluid Sealing, which owned part a Texas company that manufactured parts contributing to the accident. Though jurors ruled against Mayan and Rayburn on April 27, 1999, attorneys for the victims’ families claimed that “the tests had not faithfully simulated conditions on the test flight” according to Philadelphia Media Network. “[The] jury was swayed by an expert witness hired by Bell, Thomas Eagar, a professor at Massachusetts Institute of Technology, who explained why the seal would not leak,” one juror claimed. As crashes continued, so did the lawsuits. On April 10, 2002, the Beasley Allen Law Firm announced that the wife of a Marine helicopter mechanic had sued Boeing, Bell, BAE Inc. and 12 contractors that helped to build the V-22. Only 10 days later, several families who filed their own lawsuits settled out of court. Beasley’s client later reached a similar settlement. The families have not filed a lawsuit, but are instead demanding a formal admission from the Pentagon that their loved ones were not responsible for the accident. But the Marines, the Air Force, Boeing and Bell all continue to defend their aircraft. “Now recognized as the safest and most survivable assault support aircraft in operation, the agile, adaptable, rugged and tremendously capable Osprey is what Marines always knew it would be … an invaluable asset to the joint force, our Corps and our Nation’s defense,” Gen. James Amos, a Marine aviator and former commandant who retired in 2014, wrote in the foreword to the Osprey program’s official guidebook for 2013 and 2014. On Dec. 9, 2015, another V-22 suffered a mishap while landing aboard the amphibious ship USS New Orleans off the coast of California. 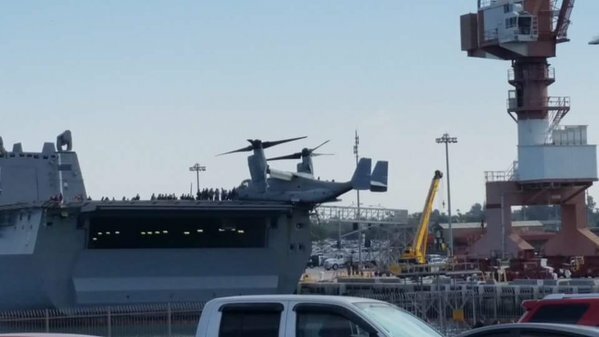 No one was hurt, but New Orleans sailed back to port with the stricken Osprey partially dangling off the deck where it had lodged. He singled out Amos, a vocal V-22 proponent who had pushed for the Corps to purchase additional Ospreys during his tenure. Just months after retiring, Amos joined the board of directors at the LORD Corporation, a defense contractor that makes parts for the Osprey and other U.S. military aircraft.